Classic idiopathic Parkinson’s disease is a progressive condition with asymmetrical onset and is characterized by motor and non-motor symptoms. Patients with classic Parkinson’s disease may present with a variety of symptoms as discussed below. Rigidityis caused by an involuntary increase in the tone in limbs and axial musculature. The examiner feels increased resistance to passive movements especially around the wrist and elbows. Initially the rigidity may be very subtle and accompanied by cog wheeling. The amount of resistance offered by the muscles remains the same throughout the range of motion which differentiates it from spasticity. An abnormally increased muscle tone increases with velocity of the movement and is seen in diseases of pyramidal pathways such as stroke and multiple sclerosis. The rigidity in Parkinson’s disease is also called lead pipe rigidity because it is velocity independent. The cog wheeling is a ratchety feeling accompanied with rigidity. In the beginning when rigidity is minimal it may be reinforced by voluntary opening and closing of the opposite hand. Rigidity of Parkinson’s disease is also asymmetrical in onset and worsens as the disease progresses. Initially patients may not be aware of the rigidity of their muscles. Resting tremor may be the first symptoms of Parkinson’s disease noticed by the patient and about 70% of patients with Parkinson’s disease may present with a resting tremor. It is an involuntary rhythmic movement, which most commonly starts in the upper limbs. Initially tremor may start just in the thumb or index finger, referred to as pill-rolling tremor, or whole hand and later may involve the legs, lips or jaw. It usually starts on one side of body initially but eventually involves the other side. Classically the tremor is present when the limbs are at rest and diminishes when the person tries to reach for something or while performing activity. A resting tremor in most cases is reassuring of the diagnosis of Parkinson’s Disease. The tremor is of the low frequency around 3 to 5 Hz and is of the supination-pronation type in the majority of patients, however in some cases it could be a flexion extension as well. The tremor is usually caused by alternative contraction of opposed muscle groups. The tremor in Parkinson’s disease may be socially very bothersome but it is less disabling as it tends to disappear with the initiation of activity, especially in the early stages of the disease. Along with the resting tremor, a minority of the patients may have a combination of mild postural tremor (i.e. tremor upon maintaining arms in an outstretched position) or a kinetic tremor (i.e. tremor with activity) but this is not typical of Parkinson’s disease. This may be seen in the advanced stages of Parkinson’s disease or in patients with a preexisting essential tremor. Upon stretching arms outward the tremor of Parkinson’s disease appears after a latecncy of a few seconds as opposed to essential tremor which appears immediately. 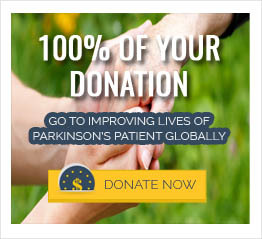 About 20 to 30% of patients with Parkinson’s disease may not have a tremor at all. Patients with Parkinson’s disease with a tremor tend to have a better prognosis than patients without a tremor. When the tremor involves the legs, it is present only when the patient is lying down or sitting. The tremor disappears when the patient starts to walk. The tremor in the hand or arms may increase when the patient is walking. The tremor of Parkinson’s disease worsens with stress and disappears in sleep. Postural instability occurs later than bradykinesia. Gait disturbance is present only in 11 % of the patients at the time of presentation. Initially arms may be flexed at the elbows with decreased arm swing on the affected side. Over time the speed of walking slows down, stride length shortens, base becomes narrows and patients may lean towards one side, turn as a whole and slowly (turning enbloc). The patients may become unsteady while turning and falls may occur while turning. A pull test is done to assess retropulsion. The patient is told to stand as firmly as possible at one place with their feet apart and they are informed that they will be pulled backward suddenly from their shoulders. The patients with impaired postural reflexes cannot hold themselves and may fall backwards if not held. When these patients try to sit in a chair, they may fall into the chair. In the advanced stages of the disease their posture becomes stooped at the neck, hips, and knees. Postural instability may not be noticeable in the early stages of disease. In the late stages of the disease, patients find it difficult to rise with their arms folded from a seated position without using support. Some patients may display festination, which is described by the patient’s family members as walking faster without being able to stop in order to avoid obstacles, along with shuffling of their feet. This is because their legs are trying to catch up with the forward movement of their upper body. Freezing is usually seen in the late stages of Parkinson’s disease. Freezing is described by patients as their feet get glued when they are trying to go through narrow hallways, sidewalks that have traffic, stepping into an elevator and when they go around corners. This may lead to falls. Some patients may notice kinesia paradoxic which is a phenomenon of sudden and short periods of normal mobility which can be confused with the ON-OFF phenomenon seen in the late stages of Parkinson’s disease. Second part (Part B) will be in next post….